by Ralph A. Rossum. Lawrence, KS: University Press of Kansas, 2014. 296pp. Cloth $34.95. ISBN 978-0-7006-1948-1. Reviewed by Helen J. Knowles, Government Department, Skidmore College. Email: hknowles [at] skidmore.edu. 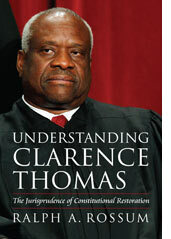 “Having written ANTONIN SCALIA’S JURISPRUDENCE: TEXT AND TRADITION, I thought it would be instructive to focus my research on the Supreme Court’s other unabashed originalist, Clarence Thomas, and to compare and contrast the two jurists’ approaches to constitutional and statutory interpretation.” UNDERSTANDING CLARENCE THOMAS: THE JURISPRUDENCE OF CONSTITUTIONAL RESTORATION is, as political scientist Ralph Rossum observes, the “result of that research” (p.vii). Eight years ago I wrote a review of Rossum’s volume on Justice Scalia (Knowles 2006; Rossum 2006). While I generally praised that book, I criticized the absence of contextual analysis that would have bolstered our understanding of Scalia by situating him within the institution of which he is a part. I also expressed concern about Rossum’s rose-tinted view of Scalia’s work. While the first criticism can also be applied to UNDERSTANDING CLARENCE THOMAS, the second cannot. Rossum has provided readers with a main argument that is entirely persuasive in its substance, and objective in its presentation. The book is divided into five chapters, each addressing a different area of the law: federalism (two chapters), “substantive rights,” criminal procedure, and race and equality. These are preceded by an introduction that provides an overview of the appointment and confirmation of Thomas, and the ways in which scholars typically perceive him, and a chapter introducing readers to Thomas’s brand of originalism. Rossum focuses his attention on what Justice Thomas has written or said (judicially or in extra-judicial speeches), for as Justice Felix Frankfurter once remarked, “voting is one thing and expressing views in support of a vote quite another” (quoted in O’Brien 2011, p.280). However, for all the strengths that can be identified in Rossum’s work with these materials, one methodological shortcoming is evident. In the book’s final chapter (predictably entitled “No Longer Doubting Thomas”), Rossum briefly mentions the papers of former Justice Blackmun. He is clearly aware of the immense scholarly value that these manuscripts hold for the author of a monograph about one of Blackmun’s Supreme Court colleagues. Rossum also acknowledges that this repository of information has the potential to shed significant light upon one “critical matter” relating to Justice Thomas’s jurisprudence: “has Thomas voted with Scalia or Scalia with Thomas? Put another way, how often has Scalia shined Thomas’s shoes?” (p.216) What Rossum does not do, however, is to [*358] make use of the Blackmun papers beyond simply observing that in SUPREME CONFLICT Jan Crawford Greenburg found, in those manuscripts, “numerous instances when Scalia changed his initial vote in critical cases and voted with Thomas after he read draft opinions written by Thomas” (p.216) (Greenburg 2007). This reviewer was disappointed that some of these “critical cases” were discussed in the book but without reference to the collegial and institutional interactions. Here Rossum missed a valuable methodological opportunity to give his analysis greater contextual substance. From the analysis that Rossum does engage in there emerges a picture of an “original general meaning approach” to the law (p.vii). Rossum does not explain, in the body of the book, that this is not his own label for Thomas’s jurisprudence. Nor does he place the phrase in what are, in the opinion of this reviewer, required quotation marks (required, at least, for the first employment of the phrase). The label is, as Rossum admits, an exceptionally helpful one (p.224 n3). For while Thomas “joins Scalia in asking what a particular constitutional text meant to the society that adopted it … he then widens his originalist focus to consider evidence of the original intent of the framers of that text and the original understanding of those who ratified it so that he can answer the question of why the text was adopted” (p.vii) Yet, as helpful as it may be to describe that as an “original general meaning approach,” it is unfortunate that the reader does not learn, until consulting the relevant footnote, that the appealing appellation is the creation of Gregory E. Maggs (2009) rather than Rossum (p.224 n3). The “original general meaning” approach is clearly delineated in chapter one. In the chapters that follow, Rossum explains how that approach shapes Thomas’s opinions in specific areas of the law. However, these sections of the book emphasize description over analysis. Employing countless quotations from Thomas’s judicial opinions and speeches, they lay out the aforementioned “overwhelming evidence” without providing the kind of incisive analytical dissection that would have given greater substance to the themes identified in chapter one (with one important exception, as explained below). Chapters two and three offer complementary treatments of federalism; the former focuses on the commerce clause, the latter on everything else (or, as Rossum titles it, “other federalism questions”). In light of Thomas’s extensive, and passionate writings on the subject, two chapters seem warranted. However, these two sections of the book could have been much stronger had they been linked together by more than three pages of summary at the end of chapter three. This editorial shortcoming is perhaps attributable to the fact that chapter two is a version of a law review article which, while revised for the book, was originally produced as a standalone piece of writing (Rossum 2011). Chapter two is home to one of the book’s rare examples of truly critical analysis of Thomas’s jurisprudence. However, that analysis is very limited, and serves as a good example of one of this book’s missed opportunities to provide readers with a deeper understanding of the subject matter. The [*359] approach that Thomas takes in UNITED STATES V. LOPEZ, PRINTZ V. UNITED STATES, UNITED STATES V. MORRISON, GONZALES V. RAICH, and NFIB V. SEBELIUS “is powerful,” writes Rossum (p.45). Yet, it is “also somewhat myopic, in that it does not address the question of how adherence to the original understanding of the text is to be secured” (p.45). Here, Rossum is referring to the fundamental changes, to that “understanding,” that were wrought by ratification of the Seventeenth Amendment. Rossum provides a four-page discussion of the framing history altered by that change to the Constitution. Yet, that is a distracting discussion that takes several passages, verbatim, from his book on the subject (Rossum 2001). It is distracting because the reader could be forgiven for forgetting that they were reading a book about Justice Thomas. He is conspicuous by his absence from these pages. Rossum is correct that the “consequences of the ratification of the Seventeenth Amendment … should be troubling to an originalist like Thomas” (p.50) Yet, this is all that Rossum says about this matter. Nowhere are we told if the Justice holds views about the subject and what they might be. The next two chapters provide informative accounts of the way in which Thomas’s “original general meaning approach” relates to “substantive rights” (chapter four) and criminal procedure (chapter five). It is not clear why Rossum chose to confine his discussion of “substantive rights” cases to those addressing the First and Second Amendments, the Takings Clause of the Fifth Amendment, and “the Court’s abortion jurisprudence” (which receives a scant four pages of treatment). However, the oft-familiar ground that Rossum covers nevertheless does provide more support for his overall thesis. In the final chapter to address a specific area of the law, Rossum provides the book’s most readable and substantively compelling discussions of Thomas’s jurisprudence. With an excellent introduction, chapter six explores “questions of race and equality.” Again, however, we find here another missed opportunity, this time the missed opportunity to engage with the Justice’s understanding of the dynamic between the Constitution and the Declaration of Independence. Thomas explained at his confirmation hearing that his interest in the 1776 document “‘started with the notion, with the simple question: How do we end slavery? By what theory do you end slavery? After you end slavery, by what theory do you protect the right of someone who was a former slave...?’” (quoted on p.19). This is a subject explored by Rossum in chapter one, but that exploration leaves unanswered many intriguing questions about just what, jurisprudentially, the Declaration of Independence means to Thomas. Chapter six provides some answers, but if that document is so central to his jurisprudence those answers should have been explained in more detail. Greenburg, Jan Crawford. 2007. SUPREME CONFLICT: THE INSIDE STORY OF THE STRUGGLE FOR CONTROL OF THE UNITED STATES SUPREME COURT. New York: Penguin. Knowles, Helen J. 2006. Review of Rossum, Ralph A., ANTONIN SCALIA’S JURISPRUDENCE: TEXT AND TRADITION. H-Law, H-Net Reviews. Maggs, Gregory E. 2009. “Which Original Meaning of the Constitution Matters to Justice Thomas.” NEW YORK UNIVERSITY JOURNAL OF LAW & LIBERTY 4: 494-516. O’Brien, David M. 2011. STORM CENTER: THE SUPREME COURT IN AMERICAN POLITICS, 9th ed. New York: W. W. Norton. Rossum, Ralph A. 2001. FEDERALISM, THE SUPREME COURT, AND THE SEVENTEENTH AMENDMENT: THE IRONY OF CONSTITUTIONAL DEMOCRACY. Lanham, MD: Lexington Books. Rossum, Ralph A. 2006. ANTONIN SCALIA’S JURISPRUDENCE: TEXT AND TRADITION. Lawrence, KS: University Press of Kansas, 2006. Rossum, Ralph A. 2011. “Clarence Thomas’s Originalist Understanding of the Interstate, Negative, and Indian Commerce Clauses.” UNIVERSITY OF DETROIT MERCY LAW REVIEW 88: 769-826. NFIB V. SEBELIUS, 132 S.Ct. 2566 (2012). PRINTZ V. UNITED STATES, 521 U.S. 898 (1997).